Tag Archive | "Spotted Green Puffer"
The Green Spotted Puffer (Tetraodon nigroviridis) is also known as the Spotted Green Puffer or Leopard Puffer by tropical fish keeping enthusiasts. It is found in the freshwater rivers, lakes, streams and flooded areas of India, Sri Lanka, Myanmar, Thailand, Cambodia, Vietnam, Malaysia, Indonesia and the Philippines as well as the brackish waters of these coastal areas. The Green Spotted Puffer has a beautiful rich green coloration on top with dark spots and a whitish belly. It has cute a pug like face with slightly bulging eyes and a small mouth that gives it a curious expression. Although they are curious, playful, extremely active and when housed alone will come to recognize its owner, they are territorial and aggressive toward their tank mates. Green Spotted Puffers (Tetraodon nigroviridis) are often confused with its close relatives the Green Puffer or Ceylon Puffer (Tetraodon fluviatilis), and the Freshwater Spotted Puffer (Tetraodon schoutedeni). All three are spotted with very similar coloration, but the Green Spotted Puffer is more rounded and ball shaped, while the Green Puffer (T. fluviatilis) is more elongated. These two puffers are relatively common in tropical fish keeping however, the Freshwater Spotted Puffer (T. schoutedeni) is rare and has not been available for years. The Green Spotted Puffer is often sold as a beginners fish and is frequently housed in community tanks with disastrous results. Like all puffer fish, the Green Spotted Puffer is aggressive and at a minimum, a fin nipper. They can be housed in a community tank with other active species such as Arius catfish, Scats, Monos, mollies or archerfish, but placing them with slow moving or long finned species is a recipe for trouble. Green Spotted Puffers can successfully be kept in groups of 4 to 5 fish in larger aquariums if there are plenty of hiding places provided. Keeping them in large groups dissipates the amount aggression that is displayed between individual fish. Green Spotteed Puffers should be kept in a densely planted aquarium of at least 20 gallons, with a sandy substrate and plenty of rocks, driftwood , twisted roots, and branches for cover and plenty of swimming area. If you want to keep more than one fish or some other species with them, a well planted 55 or 60 gallon aquarium is a better choice. Plant the aquarium with hard leaved plants. Soft leaved plants will become part of their varied diet. These little puffers are amazing jumpers and require a totally enclosed lid. During the rainy season, Juvenile puffers will jump from puddle to puddle searching for food and then return to their pond or river. The addition of floating plants into the tank is recommended to diffuse light and minimize their jumping. Because these puffers are so sensitive to deteriorating water conditions, they require heavy filtration and regular partial water changes. Although Green Spotted Puffers are considered a true freshwater species, this is true only as juveniles. As the mature, they will require a more brackish water or marine environment. Marine salt will increase their longevity in freshwater. In their natural habitat, Green Spotted Puffers are constant hunters and feed on mollusks, invertebrates, crustaceans, plant matter and fish scales. In an aquarium environment, they do well with on live or frozen bloodworms, ghost shrimp, shelled crab legs and shrimp, clams, brine shrimp and a continuous diet of snails to keep their teeth ground down. They require several feedings of small amounts per day; no more than they can quickly consume. These puffer fish are constant grazers and if allowed, will literally eat themselves to death. Spawning in an aquarium environment has been accomplished with these puffer fish but only in brackish water. They should be provided some slate or smooth flat rocks on the bottom of the tank where the female will lay approximately 500 eggs. The male will guard the eggs until they hatch out in about 7 days. , and Cyclops nauplii until they are able to eat small snails. 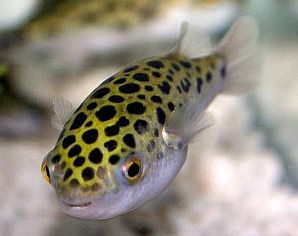 Green Spotted Puffers are commonly available as juveniles for purchase when they are approximately 1″ to 1 1/2″ in size.